You know the drill by now. 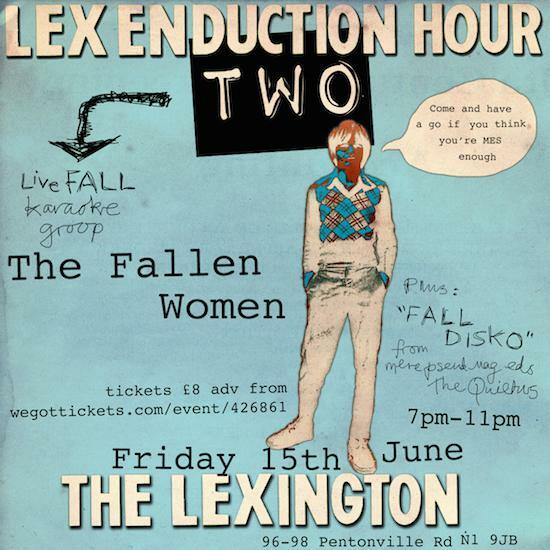 The Fallen Women provide support so you can indulge your inner Mark E. Smith in a spot of The Fall karaoke. It's happening again at London's Lexington this June, though this time the list of songs to choose from will be released in advance at midday on April 16. In order to sign up to perform after the list is released, you must have already purchased a ticket and send an email to thefallenwomen@gmail.com with your first, second and third choices. tQ DJs will be supporting on the night. As The Fallen Women explain: "Everyone is welcome, from seasoned performers to those who’ve never been on stage before or even sung a note. We provide lyric sheets if you want them, and compere Matt will be on hand to help you with any tricky cues." It all takes place on June 15 and you can find more information here. You can purchase tickets here.